Ho Chi Minh City is truly a mecca for shopping enthusiasts! Everything from handicrafts to imitation brand name clothes and shoes is available at a fraction of what it would cost overseas! As tourism has increased over time in Ho Chi Minh City , so has the establishment of trendy boutiques that cater to a tourist crowd looking beyond the typical souvenirs. However, you can find the same treasures in the many shopping areas throughout the city. Our aim of this article is to guide you on your trip to shopping in Ho Chi Minh City and help you find what you’re looking for at bargain prices! Vietnam is a manufacturing country so imitations of brand name clothes are generally cheaper than the suggested retail price! You can find both high-end brand clothing and mall brands like American Eagle Outfitters, Gap, Old Navy and more while shopping in Ho Chi Minh City. Many locals shop for clothing in the stores along Nguyen Trai street or at Saigon Square. Keep in mind that there are 3 locations for Saigon Square (Saigon Square 2 is currently closed) and, oddly, they have the same name! Many people refer to the new location as Saigon Square 3. All 3 locations carry similar items but Saigon Square 3 is cooler and more spacious than the original location. In international terms, Saigon Square is the equivalent of an Outlet Mall shopping experience; but you can bargain! This is a very popular option for tourists and expats alike. Ho Chi Minh City seems to have a specific street for everything, and shoes are no exception. In fact, the city has two streets dedicated entirely to shoes! As is the case with clothes, you will find great imitations of brand name shoes while shopping in Ho Chi Minh City. Be careful with the quality of these imitations as the heel or main body of the shoe may show wear and tear very quickly. You can find a list of shops selling authentic athletic footwear at the end of the video shown above. Ly Chinh Thang street is lined with shoe shops which carry shoes in a variety of sizes and styles. The other shoe street, Luu Van Lang is just outside of Ben Thanh Market and one block away from Le Loi street. The shops on this street have more sports shoes and sandals whereas the shops on Ly Chinh Thang street carry more fashion shoes. If you need to buy luggage to transport your newly purchased goods, visit Le Lai street between New World Hotel and Ben Thanh Market. You will see an entire street of luggage shops with the most well-known brands such as North Face, Samsonite, and more! Alternatively, if you need a fashionable handbag or wallet while shopping in Ho Chi Minh City, visit Saigon Square or Binh Tay Market in Cho Lon. If you plan on using the handbag around the city, make sure the straps are secure enough so that you are not a victim of petty theft. Yes, it’s true, you can find excellent fake watches while shopping In Ho Chi Minh City! Name the brand and you will find it! Many of them are impressive imitations but you will have to feel the weight and inspect the metal on the watch to ensure that the quality is good. Of course, Ben Thanh Market has countless stalls selling watches but expect to pay a hefty price. If you have time to explore, check out Binh Tay Market at Cho Lon or the many small shops around the market for a better bargain. Shop owners around the city buy their stock at this market at wholesale prices. You can also go to Saigon Square 1 or 3 which also carry watches. Vietnamese handicrafts are very unique and intricate. Vietnam is especially famous for lacquerware and coconut dinnerware. Bowls, plates, spoons and chopsticks make great gifts and decoration! You can also find fabulous fabric creations with patchwork and threadwork embroidery. Or, if you prefer wood items, you might like the handcrafted wooden boats and figurines that are often sold at the markets. The best place to find a huge variety of lacquerware at the best bargain prices is An Dong Plaza, near Cho Lon in Chinatown. We find that the choices for fabric and wood crafts are the best at Ben Thanh Market. Try antique street (otherwise known as Le Cong Kieu street) just outside of Ben Thanh Market. People have commented that the stores are riddled with imitations but you may find a diamond in the rough! Items include old money, stamps, war memorabilia, figurines made of ivory or bone and more. Be careful when buying “antiques” in Vietnam however as it is illegal to export real antiques out of the country. Ho Chi Minh City is home to many art galleries which host the most talented local artists. However, for copies of famous pieces of art or for original paintings by lesser-known artists, visit the “painting street”. Like shoes, there are not one but two streets that are chock-a-block full of painting shops! More locals shop at the painting stores in District 5 than the one in District 1, but you will surely find a great selection wherever you choose to go! Vietnam is often touted as the next custom tailoring capital of the world! If you have time to tailor custom outfits, we strongly recommend that you visit ‘fabric street’ to find an excellent selection of cloth for your tailored creations. Fabric street is located directly across from Tan Dinh Market. You will find even better deals on the fabric inside the market, although the stores across the street have a wider selection of fabric types. You can also visit Soai Kinh Lam material market in Cho Lon. This is a wholesale market so the prices are cheaper and the choices are more abundant. Tailors will charge less if you come with your own fabric but make sure you check with the tailor first with regard to how much material is needed for your garments. Vietnam is a cash-based society, which means that there is no such thing as a fixed price. You must absolutely bargain for the goods you wish to purchase. Remember that, in a market, there will be several stores that carry the items that you want. Therefore, the best strategy in getting things at an appropriate price is not getting attached very quickly to what you want to buy. In many cases, the owner will call you back if you walk away and agree on a reasonable price! Use the following phrases to help you with your negotiations while shopping in Ho Chi Minh City! Do you have a limited amount of time in Ho Chi Minh City? Looking for a for a one-stop shopping experience? Note: It pays to keep in mind that Ben Thanh Market, albeit convenient, can be much more expensive than the other markets due to its central location and frequency of tourist shoppers in search of the perfect souvenir. When shopping at Ben Thanh Market you should start with 40-50% of the original asking price and negotiate from there. If the store owner does not lower the price, you can just as easily go to the next stall. In comparison, you should expect to get no more than 10-20% discount on goods that you purchase at Saigon Square. You will see more locals shopping at Saigon Square or An Dong Plaza. Wherever you choose to shop, we are confident that you will be thoroughly impressed with what Vietnam has to offer. We hope you have fun shopping in Ho Chi Minh City! If you need to find the perfect souvenir our shopping scooter tour will be a good deal for you to bargain the good price. We hope you enjoyed this Vietnam travel tip brought to you by XO Tours, offering the best and most acclaimed food and scooter tours in Vietnam! If you’re overwhelmed by the size of Ho Chi Minh City and want to make the most of your time, consider booking our popular “Sights” morning city tour, and our famous “Foodie” street food tour! You can learn more about both tours by visiting our homepage by clicking our logo at the top. Thanks so much for the in depth shopping guide! Great read and will certainly use the bargaining tips mentioned. You’re welcome! Thank you for visiting our blog Jason! Thank you for the compliment Regene! We’re glad you found our shopping guide useful! Just wondering if the fabric stores have tailors attached to them or if you need to buy the fabric and then find a tailor? Do you know of any good tailors for men’s pants and suits and women’s dresses? Some tailor shops have their own fabric but the selection is usually quite limited and it’s also more economical to purchase your own fabric beforehand. Some specialized tailors will not allow fabric from elsewhere and will require you to buy their in-house fabric. As for specific tailors, we suggest that you check review sites for recommendations. Please keep checking back to our blog over the next few weeks for our entry on custom tailoring in the city! DO ANYBODY KNOWS WHERE TO BUY SHIRATAKI NOODLES, RICE AND PASTA??? Hi there, the shopping guide is very informative and helpful. How about their mode of transportation? is taking a taxi cheap? Thanks. Thank you SO much! I just moved to Ho Chi Minh, and I was looking for somewhere else to shop than Diamond Plaza. Is Cho Lon is the same as Cho An Dong ? Or Binh Tay ? Or are they all different ? Hi..any hotel near to this area (Walking distance)…and how far from airport to hotel..Please help me. Thank you. Dear Brinda Shah, im Faddzil from Malaysia n will be in HCMC dis coming early of May. Im plan to buy some fabrics to start my small business in my country soon.. could u advice me whre actually i can get the best deal of fabrics such cotton, chiffon blouse , Vietnam silk.. its an appreciation if u could reply me via my email [email protected].. tq for such a great n helpful tips n tricks..
For very large amounts of fabric, we recommend visiting the fabric market in District 5, although the choices are more varied at Tan Dinh market in District 3. Information on the location of these markets is available on this blog. Good luck! Where will be good to stay in HCM that is near shopping place? TripAdvisor is a great resource for finding the best hotel for you. Good luck! What a great site, well done for all your time and energy and promoting Saigon, it shows your love for the city. Could you please advise me what is roughly the average price for shoes and also tailored made suits, average to good quality. In Ho Chi Minh City, tailor made shoes will cost $80+ and a good tailor made suit will be upwards of $200. The cost is cheaper in Hoi An, but you have to be careful of the quality. Is it better to forex in ho chi minh than in my country? which is better to use when buying souvenir items, USD or VND? You will most likely get a better exchange rate if you exchange to VND in Vietnam. When shopping, it is best to pay in VND. Where to buy muslim ladies clothing in Ho Chi Minh? Hi Camilla, around Ben Thanh market, there are many Malaysian stores that sell hijabs and abayas. As a lot of nike products are made in vietnam.where could i get these products and sports shoes too. The safest place to buy genuine brand name products are in big department stores, like Diamond Plaza. The second shoe street has many sports shoes, but many may be imitation products. Thanks for the great insight into Vietnam shopping,culture and location details. I’m a women wear importer from India and travel to many countries including S.Korea,Malaysia and Indonesia etc for my sourcing. I have been strongly advised by friends to explore Vietnam for high quality women wear. What markets and ares should I target in HCMC and/or Hanoi ?? You advice will be extremely valuable. Please see our shopping blog for exact locations for clothes markets in Ho Chi Minh City. This guide is still valid. Just tried most of the spots today and got some really good deals compared to back home. What fantastic information – and you are spot-on ! Please contact us at [email protected] and we will be happy to help you create a custom tour. Hi, just want to ask, how to buy online do Russian market have website that we can buy online from other country? The Russian Market does not have a website, and in fact most markets in Vietnam do not have a website with online ordering capability. Thanks a lot! Your blog very helpful for me as a first timer to HCMC. Anyway, i’m starting a small clothing business. Can you recommend me where to find manufacturer for women’s clothing. I dont think the tailors would accept bulk order is it? Please call Ms. Anh at +84 93 570 5655. She works in Hoi An and has experience in bulk orders for stores. In general, many tailor shops in Hoi An do bulk orders, but it’s more rare in HCMC. Good luck! There is an area near Calmette and Le Thi Hong Gam streets that has restaurant equipment. A quick drive around that area and you will be sure to see it. We are not sure whether it is used but their prices are generally cheaper than Kim Nguyen and other larger appliance stores. Good luck. Awesome article! Been looking for info like this to thankyou! I was wondering where to find Nike’s free run sport shoes? They can be fakes, as long as they are cheap! You’ll find them at either shoe street, but the shoe street closer to Ben Thanh Market has more sports shoes. Authentic items are difficult to find but fake goods are available at many of markets listed in the shopping blog. Hi, Thank you for this blog. It’s a big help for us since our purpose to visit Vietnam is really for shopping 🙂 I just want to ask where is the best place to buy original The North Face jackets w/ gore-tex and original Kipling bags? How can we spot the difference if it is fake or original? And lastly, up to what time are the stores open at night? The Russian Market is a great place to buy cold weather items. That being said, many of the name brand goods you find here are not real (they are purposely manufactured copies, stolen goods, or factory rejects). For original name brand items, you should only buy them at authorized retailers such as the ones inside Vincom Plaza or Parkson Shopping Centre. The interesting thing about the fakes here is that a lot of them have been manufactured to make it very difficult to tell whether they are real or fake. However, the only way that many companies can make fake products and still make a profit is to cut corners, whether it is on the quality of the material or the cost of quality control. For winter wear for instance, even though it may have tags that say The North Face and it may look completely legitimate, the lining and the warming/cooling technology may not be real, simply because the main purpose of a fake is to aesthetically look the same as the real thing. Most stores and shops are open normal business hours, or slightly longer in the evenings. To purchase things in the evening outside of normal business hours, you could try the Ben Thanh Night Market. Hi! 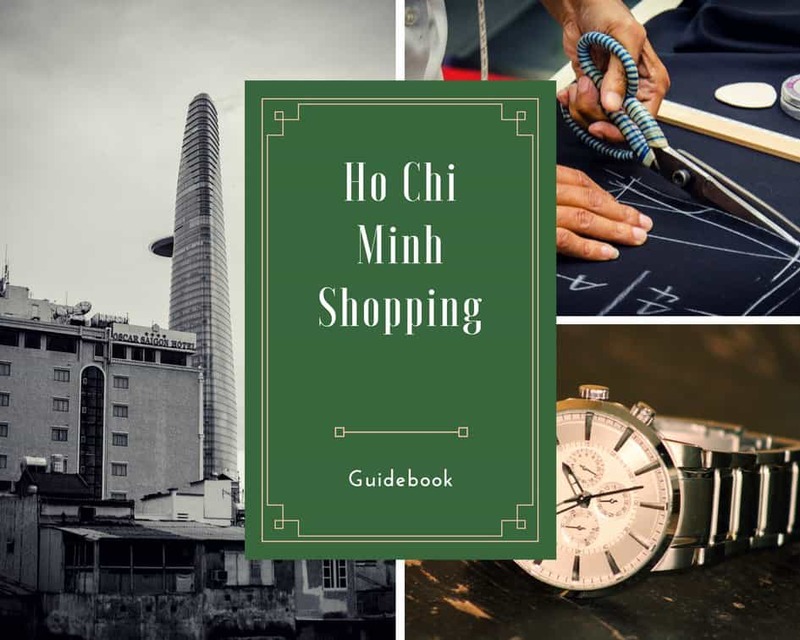 Great guide to HCMC shopping! Please provide address of Russian Market. Thanks! The Russian Market is located at 225 Ben Chuong Duong, District 1.
where can I buy some zippers in hcmc? accessories for fabrics ? Tan Dinh market has many stalls that sell buttons, zippers, trim, etc. Hi Brinda. You’ve provided me with lots of useful information. Just wondering if it’s easy to find halal food. Tks! It’s relatively easy to find Halal food in Ho Chi Minh City. Many Halal restaurants are located nearby the Sheraton Hotel. I am going to Ho Minh City in November. The information you have supplied on your blog is excellent. Thank You so much. could you please suggest the places to buy fabrics, warm clothes,genuine electronic goods and watches at fixed price. i do not want to bargain. Starting from Ho Chi Minh to Nha Trang and ends at hanoi to visit ha long bay. from two agencies that i have sent to. Can you advice me if it is possible to travel to ho chi minh and book day tours there on the spot? You should be able to book most day tours in Vietnam on short notice. For some of the more popular tours, and Halong Bay Cruises, I would suggest prebooking at least 1 month ahead of your desired dates. I think in Saigon Square everything to buy are in reasonable prices. But one thing I can’t forget there is I had been offended twice. I’m about to approach the sales lady of Jacket and the woman is nagging me. I have money or cash to buy on my hand, but I can’t understand why she’s not friendly to costumer. I think sales ladies should be friendly, approachable, and patient especially to visitor like me. And always think that costumer is always right! we have the freedom to decide and choose. I totally lose my cool and never visit that place anymore. I prefer to shop in Thailand and Hong Kong sales ladies are friendly and nice. We agree. The attitude of the vendors in Vietnam needs to improve dramatically if they want visitors to return. Thanks for the superb information! If i’m looking for lace and removable bra padding, which market do you think I will have the best luck? thanks again! Would you please kindly tell me where can I buy fruits with lowest price? How should we bargain for fruits? Should it be 50% from the price they offer too? It would be really helpful, if you can list the Vietnamese words for fruits and “How much is it?”? If we buy fruits, should we buy them in kilograms, half kilograms or we can buy 1 fruit only? Is it polite if we walk away after we bargain for the price but we don’t agree on the price? 4/4/2016 Saigon Square 2 is no longer there. Yes, we updated the post with the address to Saigon Square 3, which is the newest location. Thank you for a great information. Im planing yo visit HCMC next week. Where can I buy factory reject brand shoes? Thanks in advance! I am looking for hand carved stamps with personalised designs – does anyone know where to find them in HCMC? I am very interested in getting good quality replica handbag… where do you advice me to do? Thank you so much. Greatly appreciate your help. I’ll be traveling to Vietnam next month and I’m interested in buy some “Icebreaker” brand clothing. This is a brand from New Zealand and the clothing is made using Merino wool that is imported from New Zealand. Can you suggest a location where I might find some of this type of clothing? Hi there, can I buy authentic Van shoes in vietnam? Hi, may I know what is the opening hours of Nguyen Trai Street in district 5? This is a great information for me since me and my family is planning a tour there this coming February 2016. Please can you advise which place can I buy 5.11/NorthFace/Columbia products in that City? Also which hotel can you recommend that is near these shopping place? How about the street food? are they safe?